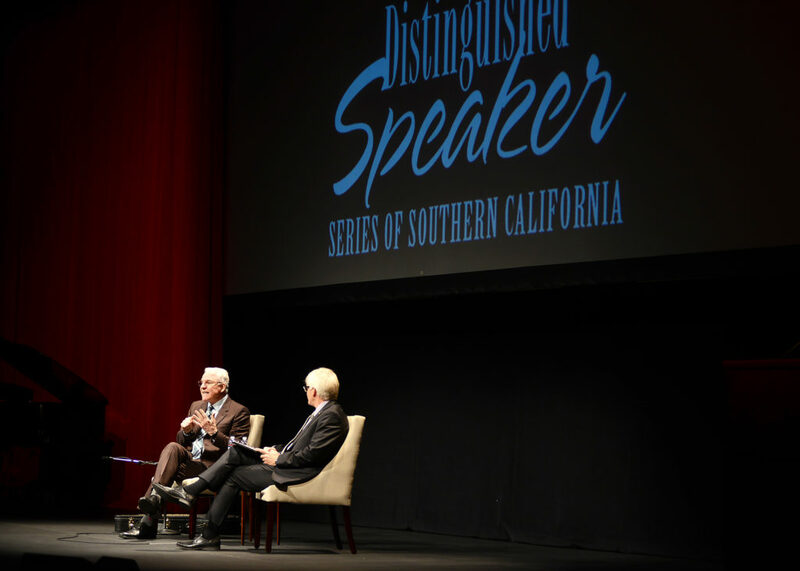 Distinguished Speaker Series of Southern California continues to thrive with an impressive roster of speakers. Co-founded by two sisters Kathy Winterhalder and Sue Swan over 20 years ago. Los Angeles residents will have yet another chance to hear inspirational speakers in the Entertainment, Sports, Media, Authors, and Political industries. This year’s honorees of speakers includes Steve Martin, General David, Petraeus, Diana Nyad, Ayaan Hirshi Ali, Vin Scully and Captain Scott Kelly. Speakers in the past included everyone from His Holiness The Dalai Lama, Elie Wiesel, Maya Angelou, Robert Kennedy, Jr., Rudy Giuliani, Anderson Cooper, Vicente Fox, Robert Redford, Michael Phelps, Betty White, Lisa Ling to Anthony Bourdain. PPLA was in attendance for the opening night where Steve Martin spoke to a full house at The Saban Theatre. Martin gave an enlightening and humorous speech complete with a performance on the banjo. Afterwards, PPLA sat down with Kathy Winterhalder to get an inside exclusive of this exciting speakers series. 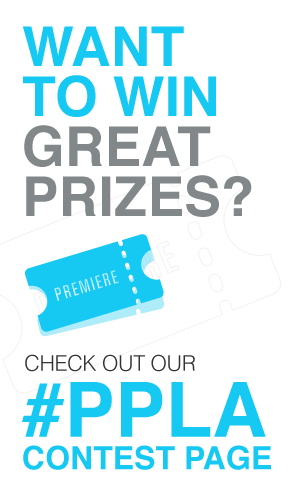 PPLA: Tell us, how did Distinguished Speaker Series of Southern California get started? PPLA: When did it all become official? KW: Twenty-one years ago we launched the series in Pasadena. It went well. We thought okay- maybe we can get our expenses down by adding a second location and having the same speakers speak two nights in a row. And that’s what we did. We then branched out to Redondo Beach then two years later, we set up in Thousand Oaks. Then we waited fifteen years before we moved to Beverly Hills. We bring the same speaker to the Los Angeles area four nights in a row starting with Beverly Hills on Sundays. PPLA: What inspired you all to do this? KW: Originally, I have to say that my parents helped us part-time because it was a larger undertaking than we first thought it would be. So they came and helped us, my dad did the books, my mom answered the phone and my sister (Sue Swan) was a Hollywood Casting Director so she did a lot of the contracting. I had a lot of experience in marketing, sponsorships and sales. So that’s where we used all of our different skills. Then about ten years later, my parents decided to retire. For the past eleven years, it’s been just my sister and I.
PPLA: Why do feel it’s important to have Distinguished Speaker Series of Southern California? KW: This is really one of the only formats left where the community can come together and a newspaper, news station or cable news are not picking the five minutes you are going to hear. Our events last an hour and a half with questions and answers from the audience. Almost every time the speakers are always candid with great stories but you learn something that if you just depended on a five-minute snippet that every one else decides for you. This is just a different perspective. And I love the fact that the community comes together and leaves feeling a lot smarter, usually than when you come. PPLA: Who are the next speakers? KW: The next speaker is Ayaan Hirshi Ali. She is a Muslim Scholar, you will learn more about what’s going in that culture and her life story. And then we have Vince Scully and he has been around really since Jackie Robinson. Not only can he talk about the evolution of baseball but also he can talk about the evolution of our culture and what’s happened over time. Then we have Scott Kelly finishing it up with spending a year in space. What’s exciting about him that idea that we can maybe live in Mars. And he was ones that really tested his body so that we could study to see if it’s possible. We have had almost every world leader that there is. We have had The Dalai Lama, Margaret Thatcher, F.W. de Klerk, Maya Angelou and Tom Wolfe. That’s what I am most excited about is the next day- I will go out and sit at a Starbucks and I will hear people talk about it. What they have experienced so I feel good about what we are bringing to the community. PPLA: How are the speakers chosen? KW: At first, we got some advice and tried to decide who we thought would work out well. But now we really use these speaker surveys to get a feel. But since we have done it for twenty years, there are some trends. We know during an election year that no one wants to hear the politicians. This year’s line up is much less politics than what we usually do. And then it helps us understand who people really want to see and what topics they are interested in. We found our subscribers like history, they love when historians come to tell stories. They love the storytellers, we try to have an adventurer like this year we have Diana Nyad. We have had Beck Weathers who climbed Mount Everest. We will get an idea of who they want to see. PPLA: What’s the next step in the process? KW: Usually what we do is look at the survey and then we have a budget because the speakers fee and everything because it’s a business. We will really try to go with the hard to get person first usually that’s the most expensive. And we will wait to see if we can do it. So what we will try to find out, democrat or republican who is more expensive or who is reasonable. Put this puzzle together then we go out and approach them to see if they will do it. And a lot of times we have been lucky and they are willing to do it. I think they like the idea they are not speaking to a partisan group or somebody who wants to do a sales presentation to their sales reps. Its very unique to just have an opportunity to talk to people. The public as there’s no criteria to be a member of the speaker series. You just buy tickets and join us. PPLA: Lastly, anything else you would like the public to know? KW: Come join us. Probably the last time you did something like this was in college and the lecture was not that fun. But I think things like TED are starting to excite us. There’s a lot to learn. It’s a fun date night out. It’s a fun intergenerational thing. If you notice in the audience, there will be people in their 30’s with their parents. How many times can you call your mom or dad and talk about the same old stuff? This is something you can share together that is different. Same with husbands and wives. I had a girlfriend who bought a series and she brought her match.com dates because she wanted to find an interesting partner who would enjoy something like this. Join us. Take a chance. It’s a lot of fun. You will learn something. I think you will leave laughing or feeling good that it was worth your time. For more information, or to purchase a series package, visit: www.speakersla.com.